There is something palpable about the anticipation we share with other human beings in our midst, right before something special is about to happen. We feel it in the moments before the band takes the stage, before the arrival of a loved one at the airport or in the urgent hush before a surprise celebration. There is a temporary, heightened sense of wonder, curiosity and vulnerability in these moments of anticipation. A sense of hope. On December 1st, 2016, I joined a friend and her son to see the arrival of carolling ships in Ladner, British Columbia. 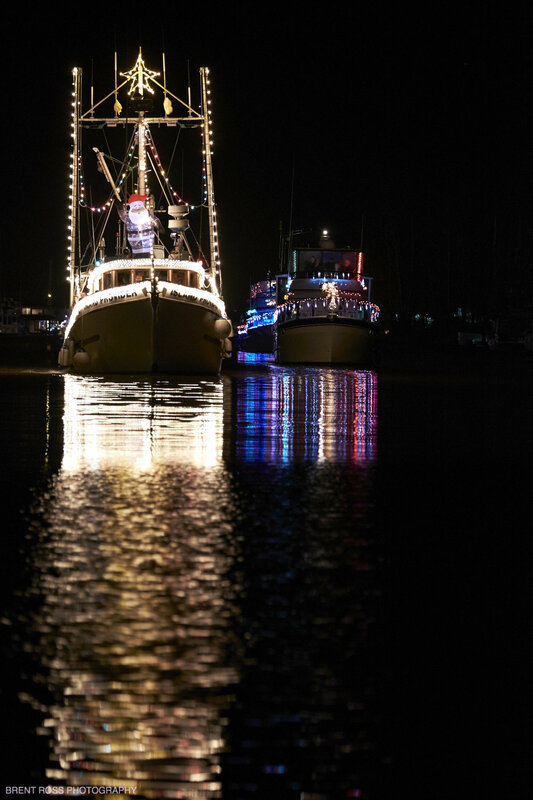 It's an annual tradition where fishing and pleasure craft of various sizes make their way down the Fraser River in a convoy of sorts, fully decked out in lights and holiday decorations. As we passed the 7pm mark when the boats were scheduled to arrive, I couldn't help but be struck by all the the people above me gazing down the river waiting to catch their first glimpse of the floating parade of light. It occurred to me in that moment that this is a ritual we as humans have reenacted, over and over again, for centuries. Regardless of whether we have stood waiting together for the arrival of food, warmth, safe passage, goods to trade, or the arrival of loved ones by train, plane or boat, the magic of that moment bares the essence of our humanity. It is fuelled by our collective and individual imaginations, as well as the ritual preparation for any gathering to welcome the arrival of someone, or something important to us. In the days since the event, I’ve also been thinking about how I can create the magic of this anticipation in my life a little more often. I don’t know about you, but unless I have something special planned, or I'm actively envisioning my future on a regular basis, I mostly wake up each day expecting some variation on the day before. I recognize this as my past casting its shadow over my future. This too, of course, is human. When we anticipate an arrival of any importance, there are things to prepare. Guests visiting our home must be met with a clean space. Heads of state are prepared with protocol to greet their counter parts visiting from another country. And then there are the less tangible preparations we make for things like the arrival of inspiration, or even just to meet the day, such as meditation, prayer, exercise or journalling. The more care we take in our preparation for anything, often our sense of anticipation will be greater. The ancients gave these questions a great deal of thought in specific contexts. Perhaps one of the best ancient examples of this is Feng Shui - the art of physically placing objects in a space to reflect ones intentions, and to align that intention with the physical laws of our world. Tibetan Buddhists take painstaking preparations to ready themselves for death, an event that is celebrated rather than feared in their culture. These are examples of ritual preparation for the arrival of people, moments and experiences that are fundamentally unknown, but still anticipated. Before we can develop meaningful, ritual preparation to welcome aspects of something we envision for ourselves, or even for the unknown, we must consider the possibility of the arrival that is not yet planned or even envisioned. We MUST be willing to consider that the next moment, or the next day is truly unknown to us - that there are pathways to our intent, in that context, that we are not capable of seeing when the future is being hijacked by our past. I believe we can cultivate wonder and anticipation about the unknown even for rituals that appear to be known all too well. Perhaps all it takes is a change of routine around the arrival of children home from school, a spouse returning from a business trip, how we plan for a meeting, or a mission critical project. Perhaps it's a ritual check-in with your significant other about the day to ensure your next day together is unhindered by any emotional baggage from today. It could mean revisiting and revamping a family financial plan on a regular basis. Or simply tweaking your bedtime and morning routines to include a small ritual that has you anticipate what you cannot imagine, as well as that consistent with your intent. Would you turn off all the screens in in the house and hit the sack an hour earlier if you knew that you needed to be fully rested for what could be the most important day of your life? What if every person who greeted you in a day was treated like a new guest in the house that is your life, including the homeless person who asks for change? How would your next conversation with a friend be different if you were full of anticipation for your life? Whatever we think is next for us, I believe the potential and possibility of our presence in the world can be amplified when we ritually prepare for and anticipate the arrival something more, especially moments or opportunities that would seem to bare little significance at the time. It will surely be more so when we find creative ways to share that with others. Then, when the unexpected guest finally arrives, the moment is ours to welcome them fully, with humility and curiosity. (If you already have thoughtful rituals that help build the anticipation in your life, I'd love to hear from you in the comments).